..som sagt tidigare, denna mystiska motor som en vän fick, ska var en Jawa! När jag såg den senast låg den i ett förråd, ny fick jag några nya bilder. Den kom till Sverige som en gåva från Frantisek Stazny en racer förare till en annan, då var den komplett, under åren som gått har delar försvinnit, enl. säker källa så försvann förgasarna först; ett par Dellorton. "One of the most mythical race bikes of all times, the 1968 Jawa 4 cylinder, Type 673. 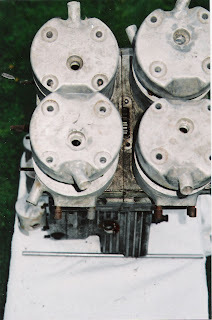 Not quite a dozen of 350 Jawa 4 cylinder were developed by the race department of the Jawa factory from 1968 to 1971. Racers like Bill Ivy, Silvio Grassetti or Jack Findlay, to cite only the most famous ones, rode these bikes. Other Czech drivers, Frantisek Stazny, Boumil Staza or Peter Balaz, also rode Jawa 4 mainly in eastern European countries. Beyond the Jawa works team, some of the Jawa 4 were entrusted to Czech clubs in order to participate in races. The history of this mythical bike goes back to 1966, originally introduced as 250 cc. For the 1968 season, the FIM modified the technical regulations of the World Championship, banishing the 250 cc with more than 2 cylinders. 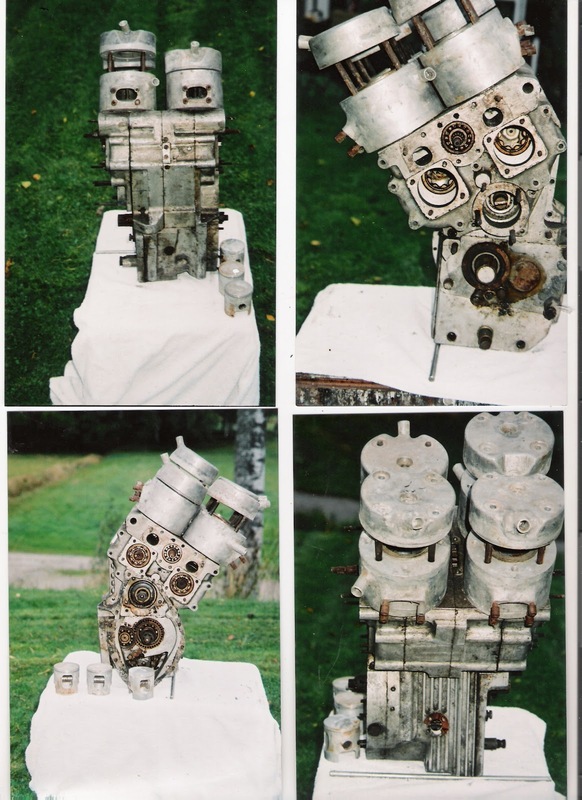 Yamaha replaced its 250 4 cylinder RD 05 by the RD 56 bi-cylinder, and Jawa its 250 4 cylinder by the 350 4 cylinder. The Jawa 350 4 cylinder was difficult to drive and unreliable. The used period materials mostly produced in eastern countries were known for those troubles. Bill Ivy lost its life with a Java 4 following an engine problem. In any case, those were machines with high-performance, proven by the victory of Silvio Grassetti in the 1969 GP of Yugoslavia and the two second positions behind Agostini in Hockenheim and Dutch TT. The factory stopped development of these machines end of 1969. The here presented bike is an authentic Jawa 4 from 1968. 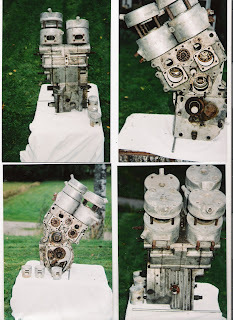 It left the Czech Republic end of 1998 following the initiative of a former works mechanic. It’s complete and in its original condition from that era, running and in working order. It has never undergone any restoration. All parts are period and original, including the Amal carburettors with separate Dell’Orto chambers. The engine is a 350 cc 2 stroke, 4 cylinder V with rotary distributors, water cooled, developing 75 HP at 12500 rpm and a top speed of 270 km/h. The brakes are magnesium. This extraordinary race bike is now available without spares in Italy."